The company’s niche is quick prototyping and printing of folding carton retail packaging, from as little as 500 up to 20,000 units, within extremely quick turnarounds. Creating retail packaging typically takes four to six weeks or longer. Graphic Edge Printing & Packaging turns these jobs in as little as 48 hours. The staff at Graphic Edge is so customer-focused that when a packaging opportunity comes in they are able to quickly generate a packaging design and deliver a prototype within hours. 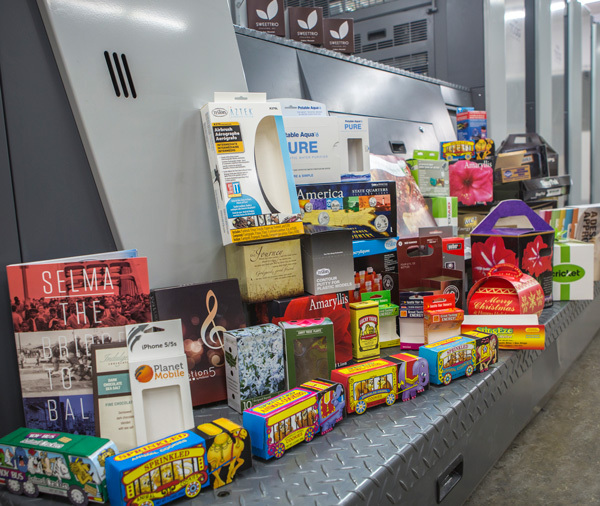 “We are constantly studying the market for new and unique packaging designs and then reverse engineering the design to fit our production capabilities,” says Tashina Peplinski, [Prepress] Manager, at Graphic Edge Printing & Packaging. Just three weeks before last Christmas, a client requested 30,000 gift-wrapped packages with bows on top for a cellular phone promotion. The client was adamant on having the bows on top, but to physically gift wrap 30,000 boxes was going to be very time consuming and expensive. The solution was to create a folding box design to include a die-cut bow on the top and print the “gift wrap” design. Within a day, the customer received a prototype and approved the job. Design, printing, die-cutting, and gluing production occurred in-house and within a few days.